Looking for the perfect low carb alternative to your favorite pasta dish? Watch out pasta lovers, your world is about to get flipped upside down. Pasta is the ultimate carb lover’s comfort food. For those on a ketogenic diet or other low carb diet, this makes pasta out of the question — until now. This keto spaghetti squash contains just 5.5 grams of net carbs per cup. Simply top with your favorite pasta sauce to recreate your favorite Italian dish. Plus, it’s packed with vitamin A, C and potassium, providing a wide array of health benefits. Before diving into the various benefits of spaghetti squash, here are a several other pasta alternatives to consider. You can use these low carb “noodles” in your favorite pasta dishes, including lasagna, mac and cheese and spaghetti. 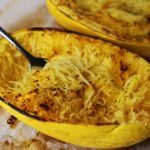 Spaghetti squash is the most common low carb pasta alternative. If you love Italian-inspired dishes, here are several other foods you can use in lieu of traditional noodles. Zucchini noodles, or “zoodles,” are simply raw zucchini spiralized into noodles. You can purchase a spiralizer for less than $30 on Amazon.com. Unlike traditional noodles, zoodles are wheat-free, grain-free, gluten-free and extremely nutritious. One cup of zoodles contains 20 grams of calories including 4.2 grams of carbohydrates, .2 grams of fat and 1.5 grams of protein[*]. It’s also a good source of vitamins C and B6. You can use your spiralizer to transform any low carb vegetable into a noodle. Summer squash, kohlrabi and cucumber are all great options. Simply spiralize your vegetable, then toss in olive oil in a skillet over medium heat for 1–2 minutes. Also known as Miracle Noodles, shirataki noodles are one of the few no-carb noodles in existence. Shirataki is a type of japanese noodle made from the konjac yam. Around 97% of the shirataki noodle is made up of water, with the other 3% being dietary fiber. One serving size (about 3 ounces) has a total of 0 calories, 0 grams of fat, less than 1 gram of carbs and 0 grams of protein. Miracle noodles are virtually tasteless, allowing them to absorb the flavor of whatever dish they’re served with. Therefore, while shirataki noodles are commonly used with Asian-fusion dishes, you can also use them for spaghetti. Want to make homemade pasta — the low carb way? Egg noodles combine eggs, cream cheese and seasoning to make low carb noodles. Simply combine the ingredients in a blender, pulse, then roll-out your dough into a baking sheet. Bake at 325 F for 8 minutes, then slice into “noodles” when you take it out of the oven. Perfect Keto recommends this recipe to make your own egg noodles from scratch. One serving contains a total of 60 calories, including 5 grams of fat, 0 carbs and 3.5 grams of protein. If you think substituting cabbage for noodles sounds a little odd, you clearly haven’t tried Italian-stuffed cabbage rolls. With less than 4 grams of net carbs, 0 grams of fat and 1 gram of protein per cup[*], you can combine cabbage spaghetti with your favorite tomato sauce for an easy pasta dish. In addition to being low calorie, cabbage spaghetti is a nutritional powerhouse abundant in key health benefits. It has strong anti-inflammatory properties, multiple antioxidants, anthocyanins and some amazing vitamins and minerals including vitamin K, vitamin C, folate, calcium, magnesium and potassium[*]. While egg noodles, zoodles and shirataki noodles are great (and offer versatility come pasta night), Perfect Keto’s favorite low carb noodle is spaghetti squash. Spaghetti squash is a strong source of vitamin A. This yellow, oval-shaped vegetable is abundant in carotenoids, alpha-carotene and beta-carotene specifically. Carotenoids work as antioxidants that prevent inflammation. Spaghetti squash is also a fighter of inflammation due to its free radical-fighting components in vitamin C. So what are free radicals? If you’re deficient in antioxidants, free radicals have the capability of attaching to cells and causing damage that could lead to the development of a multitude of different chronic diseases. Did you know that potassium actually works with sodium to stimulate muscles and nerves? Not only that, but it’s known to enhance muscle strength, metabolism, water balance, electrolytic functions and nervous system functions. Spaghetti squash will satisfy all your pasta cravings. Simply bake at 400 F for a total time of 40 minutes, allow to cool slightly, then shred with a fork. Top with your favorite low carb, no-sugar-added marinara sauce (Perfect Keto recommends Rao’s brand), alfredo sauce or meat sauce, sprinkle on a little parmesan cheese and fresh basil, and you have yourself the perfect low carb pasta night. Or, share your favorite spaghetti squash recipes in the comments! I changed one thing about the cooking method, I turned put the oil and salt on the cut side of the squash, turned it over, covered with aluminum foil and baked the prescribed time. Then I mixed white truffle butter and a wee bit of truffle oil with the ‘spaghetti’. Everyone liked it. Better than noodles! Love it! Keto made easy. I will do this tomorrow except I will put it into the microwave for about 10 or 15 minutes.